The accurate quantification of iodine-131 (I-131) activity, which is estimated from scintigraphic images, has great importance because of the recent success of using it in thyroid cancer therapy, as well as in liver cancer therapy. However, quantitative imaging is limited mainly by the phenomena of scattering and penetration into the septa of a collimator which leads to an error in the determination of activity. The highest intensity emissions of I-131 are 284 (6.1%), 364 (82%), 637 (7.2%), and 723 keV (1.8%). The photons of 637 and 723 keV undergo only a slight attenuation in the phantom, and they have a higher probability of penetrating the collimators. They are counted in the window of the photopeak 364 keV.,, The I-131 imaging was evaluated using its 364-keV photons. Several methods have been proposed to correct scattering and septal penetration in I-131 imaging.,, However, no method has yet been universally successful. The solution is to use a Monte Carlo simulation code such as simulation Monte Carlo imaging nuclear detector (SIMIND), for scatter and penetration evaluation to develop a method for correcting these events. The aim of this work was to evaluate the imaging parameters of I-131, especially the collimator acceptance angle to obtain the optimum conditions allowing as much as possible the precise quantification of the activity. We simulated the Siemens Medical Systems equipped with high-energy collimator using Monte Carlo simulation SIMIND code version 5.0. 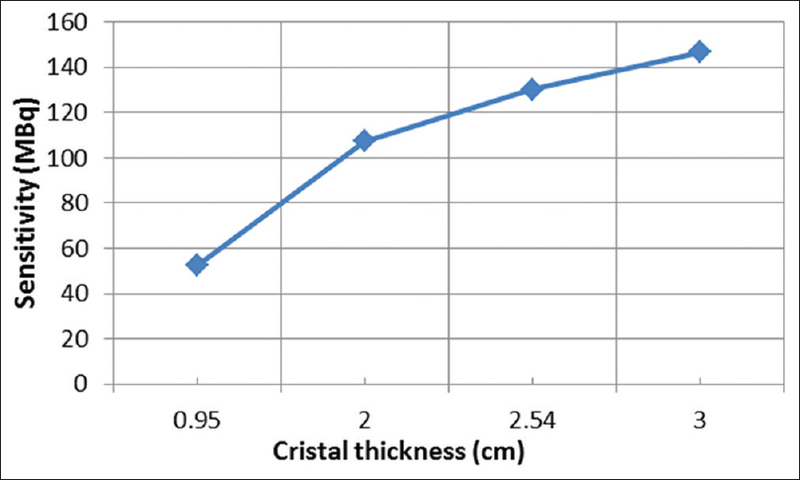 We used the following imaging parameters: 0.95 cm NaI (Tl) crystal thickness, intrinsic spatial resolution of 1.2 cm, and energy resolution of 9.80% at 140 keV. The dimension of the crystal was 50 cm × 40 cm. The energy window setting was 20% at 364 keV. The collimator data used during the simulation are given in [Table 1]. A cylindrical water phantom of dimension 22 cm × 30 cm × 22 cm was placed at 20 cm from the detector surface. We used the SIMIND Monte Carlo simulation to acquire the data from I-131 point source of 0.005-cm diameter located at the center of the cylinder phantom. The images have 0.3 cm pixel size and 128 × 128 matrix size. We imported binary images created by SIMIND in ImageJ software, National Institutes of Health and the Laboratory for Optical and Computational Instrumentation (LOCI, University of Wisconsin. In this study, we used the acceptance angles to evaluate the image quality. Photons are isotropically emitted from a point source O, but the photons which are only propagating within the angle α can be detected [Figure 1]. 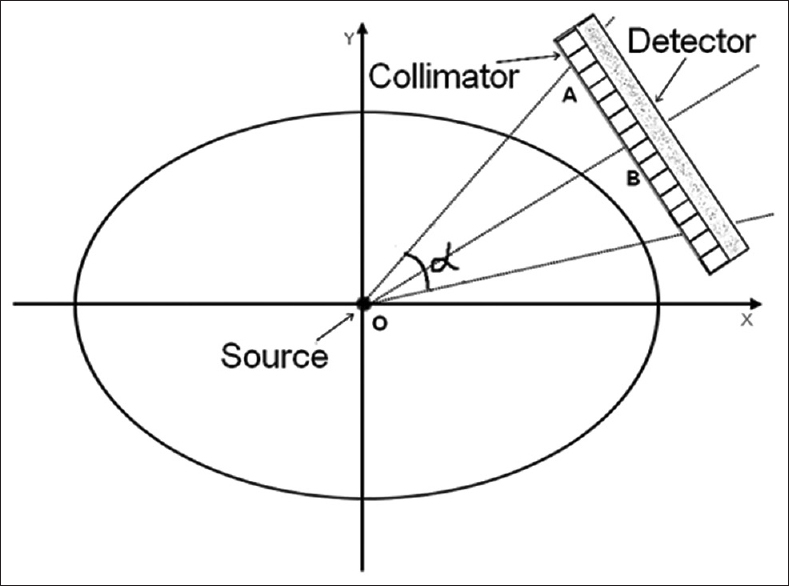 The angle α can be defined as the collimator acceptance angle, and it is determined by the ratio of the hole size and length of the collimator. Practically, the acceptance angle α is small to eliminate most of the tilted rays. The contribution of geometric, penetration, and scatter photons was calculated for a point source at 20 cm from the detector surface as shown in [Table 2]. When the acceptance angle is 45°, the geometric component is very weak and does not carry even half of the detected photons. The scattering and penetration components are increased by the contribution of the 637-keV and 723-keV photons in the photopeak energy window, and thus, the geometric photons are decreased., When 4.845° is used, we notice that the geometrical component goes up to (82% at 20 cm) that explains why the contribution of the photons of the upper peaks becomes weak. This is due to small acceptance angle. 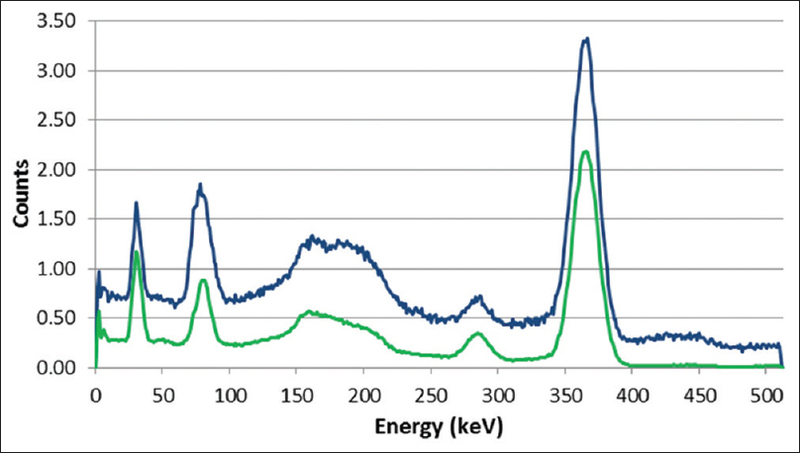 [Figure 2] diagram shows that blue and green spectra are obtained when the acceptance angles are 45° and 4.845°, respectively. The counts of blue spectrum are more than the one in the green spectrum. That can be explained by the existence of other peaks of high energies such as 637 keV and 723 keV which can be detected by the detector after the scattering in the collimator. Hence, the photopeak energy window in the case of 45° contains an important part of the scattered photons in comparison to the case of 4.845°. 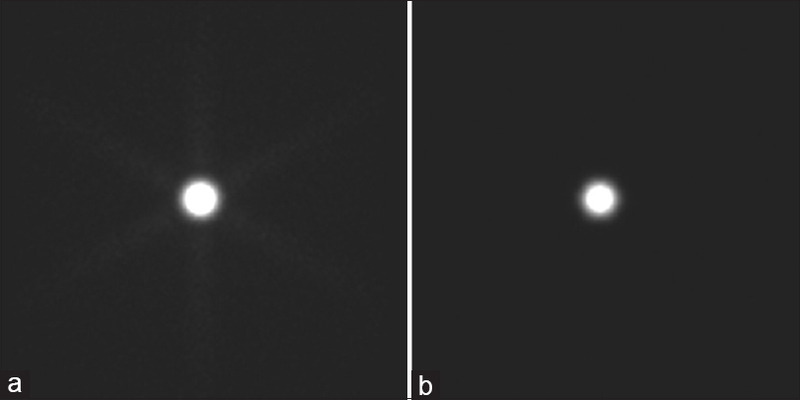 A star like appears in the image of [Figure 3]a resulted from septal penetration, while this star is not as clear as the image for [Figure 3]b. According to [Table 3], the best resolution is obtained when the distance between the source and the detector is 12 cm full-width at half-maximum (FWHM = 7.21 mm, full-width at tenth maximum [FWTM] =12.36 mm), but the sensitivity slightly decreases at the same distance. [Figure 4] shows that the sensitivity becomes large when using the 3-cm thickness value. In this study, we have evaluated the imaging parameters for I-131 using Monte Carlo simulation. The obtained results show that the image quality very depends on the acceptance angle. When its value equal to 4.85°, the good results were obtained for the geometric component (81.98%) and the resolution (FWHM = 7.21 mm, FWTM = 12.36 mm). van der Have F, Ivashchenko O, Goorden MC, Ramakers RM, Beekman FJ. High-resolution clustered pinhole (131) Iodine SPECT imaging in mice. Nucl Med Biol 2016;43:506-11. Kocher DC. Radioactive Decay Data Tables: A Handbook of Decay Data for Application to Radiation Dosimetry and Radiological Assessment. DOE/TIC-11026. Springfield, VA: National Technical Information Service, U.S. Department of Energy; 1981. p. 133-4. Autret D, Bitar A, Ferrer L, Lisbona A, Bardiès M. Monte Carlo modeling of gamma cameras for I-131 imaging in targeted radiotherapy. Cancer Biother Radiopharm 2005;20:77-84. Dewaraja YK, Ljungberg M, Koral KF. Characterization of scatter and penetration using Monte Carlo simulation in 131I imaging. J Nucl Med 2000;41:123-30. Rault E, Vandenberghe S, Van Holen R, De Beenhouwer J, Staelens S, Lemahieu I, et al. Comparison of image quality of different iodine isotopes (I-123, I-124, and I-131). Cancer Biother Radiopharm 2007;22:423-30. Kojima A, Gotoh K, Shimamoto M, Hasegawa K, Okada S. Iodine-131 imaging using 284 keV photons with a small animal CZT-SPECT system dedicated to low-medium-energy photon detection. Ann Nucl Med 2016;30:169-75. Lee YS, Kim JS, Kim KM, Lim SM, Hee-Joung K. Determination of energy windows for the triple energy window scatter correction method in I-131 on a Siemens SYMBIA gamma camera: A GATE simulation study. Sissa Medialab 2015;10:1-8. Dewaraja Y, Li J, Koral K. Quantitative 131I SPECT with triple energy window Compton scatter correction. IEEE Trans Nucl Sci 1998;45:3109. Bong JK, Son HK, Lee JD, Kim HJ. Improved scatter correction for SPECT images: A Monte Carlo study. IEEE Trans Nucl Sci 2005;52:1263. Ljungberg M. The SIMIND Monte Carlo program home page. Available from: https://www.msf.lu.se/forskning/the-simind-monte-carlo-program. [Last accessed on 2018 Aug]. Ferreira T, Rasband W. Image J Program. Available from: https://imagej.nih.gov/ij/download.html. [Last accessed on 2018 Aug]. Cao Z, Qian L. A triple-head SPECT system with parallel-hole collimators of different acceptance angles. Int J Med Inform 1997;46:145-57.